Those who pay attention to the "birding scene" here in Ontario are undoubtedly aware of the Black-headed Gull that has been making the rounds at various locations in Niagara Region over the past few months. It was first discovered by two groups of birders back on December 3, 2016, as the gull flew down the river to roost on Lake Ontario for the night. The first group included Alex Wiebe, Augie Kramer, Eric Sibbald, Jeremy Collison, Max Kirsch, Read Barbee and Sarah Toner; they had the gull near the power plants heading downriver. A few minutes later, Ed Poropat and Jim Hopkins had it fly past them at the mouth of the Niagara River (Niagara-on-the-Lake). 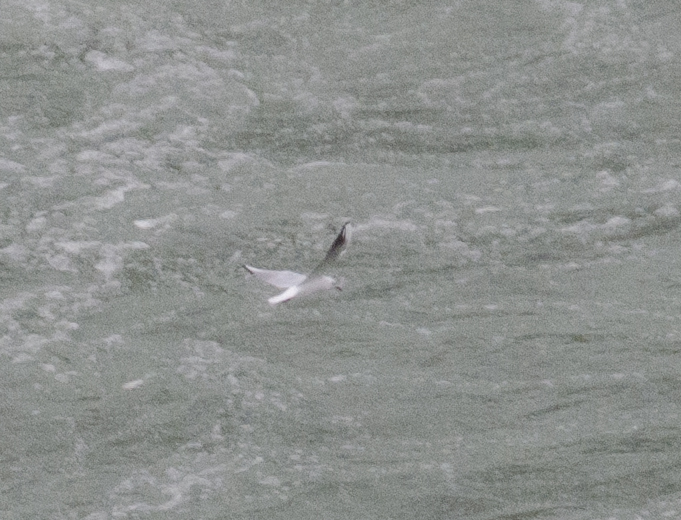 In the following days and weeks, the adult Black-headed Gull became a mainstay at the Whirlpool, one of the better gull-watching sites on the lower Niagara River, but it was also seen at several other locations along the lower Niagara River. While by no means guaranteed at the Whirlpool, it was fairly reliable and most birders who tried to find it were successful in the end. Since the Whirlpool is a two minute drive from my house I was lucky to view it a half dozen times from here, though I also struck out on about half my visits! While the Whirlpool is a great spot to scan for small gulls, it does not provide much by way of photographic opportunities since you are shooting way down towards the river from the top of the gorge. 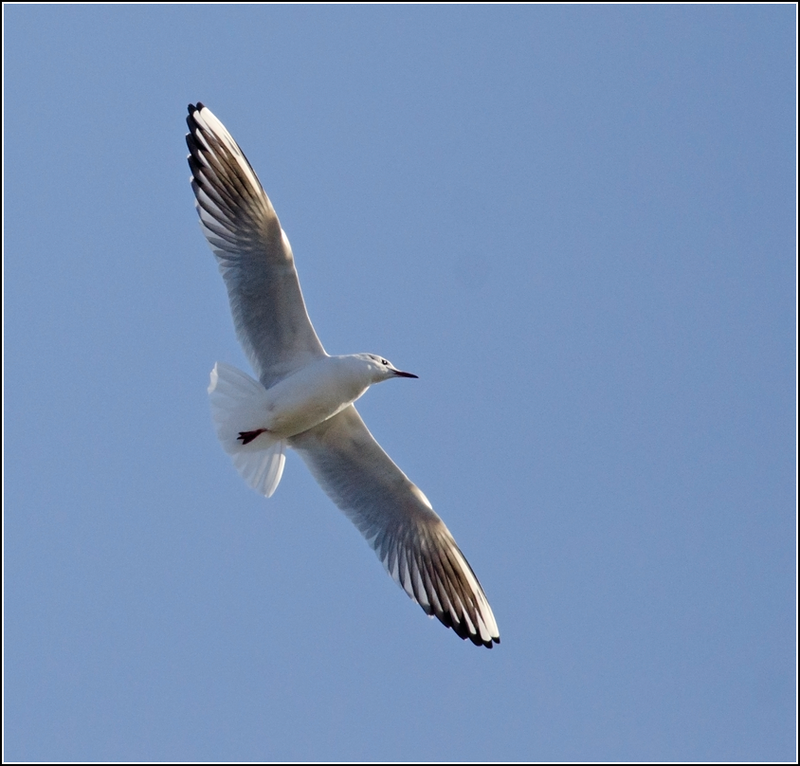 This is all I could manage during the one occasion I attempted photography of the Black-headed Gull. Identifiable, but that's about the only good thing about this image! Since early January the Black-headed Gull has ventured further afield and sightings from the Whirlpool have been sporadic at best. This is around the time that Bonaparte's Gulls become much less numerous on the river, as they do by mid-winter each year. As a result, the Black-headed Gull has now resorted to hanging out with Ring-billed Gulls and Herring Gulls. 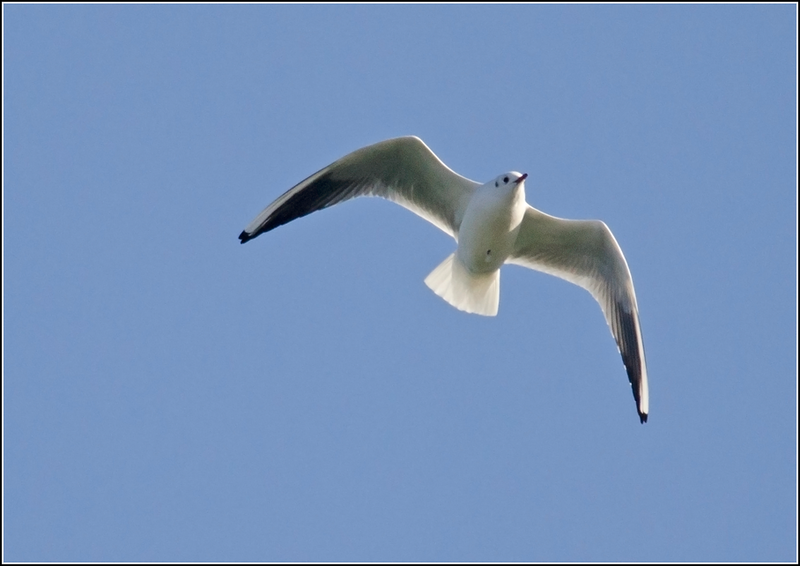 Dan MacNeal was the first to discover the Black-headed Gull away from its usual haunts along the river, when he spotted it at the famous Slaty-backed Gull spot in Thorold on January 17, though it did not stick around very long. 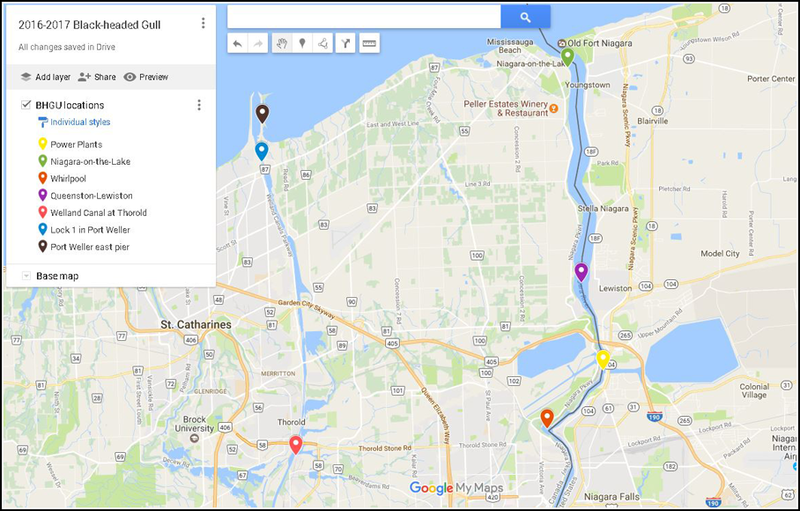 Below is a map of eastern Niagara Region with pins identifying each of the locations where it has been seen. On Thursday February 2, Ryan Griffiths was the next lucky individual to come across the bird away from the river, as he found it at the water outflow at Lock 1 of the Welland Canal in Port Weller. He took some phenomenal photos of the bird as it flew around with the other gulls, photos that made me just a tad jealous! Port Weller is a place I bird as often as I can and it is perhaps my favorite spot in the county, apart from Wainfleet Bog, and Black-headed Gull would be a great new addition to my Port Weller list! 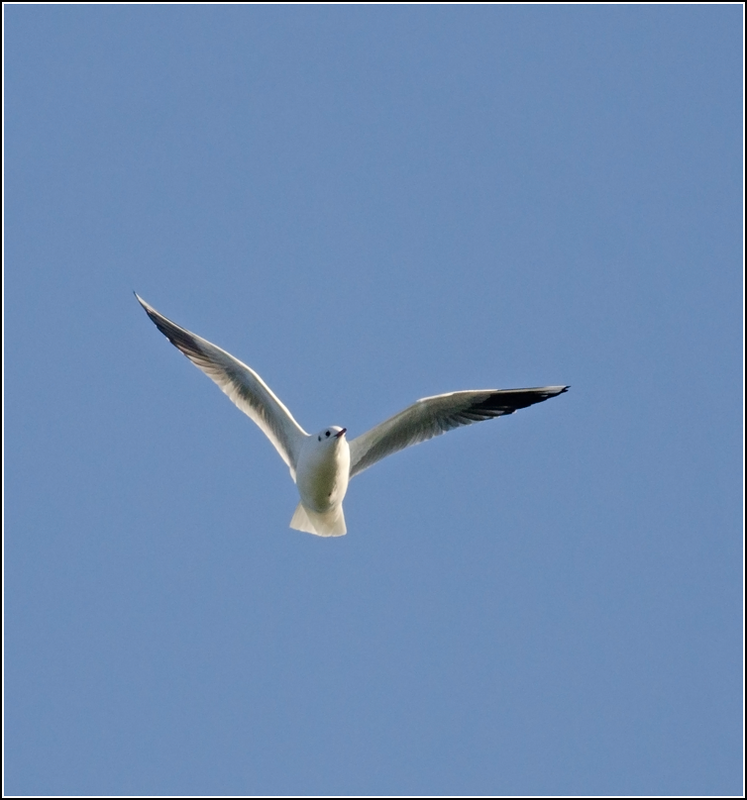 Plus of course, it is not too often that one gets a chance to study Black-headed Gull from up close in Ontario. I cleared my schedule for today to go birding and so Port Weller was first on my agenda. I checked the water outflow first but there was no Black-headed Gull in sight. I was not too surprised, this bird had been seen in a variety of locations and apart from at the Whirlpool, it had not stuck around for very long at any location. I decided to drive over to Jones Beach with plans to walk the Port Weller east pier. I made it about a kilometre down the pier before abandoning my plans due to the excessive wind that was not making it easy to scan things with my scope. On the walk back, a big group of gulls that had been roosting on an ice flow in the lake all got up at once and started flying my way. I noticed a smaller gull with some of them and was surprised to see that it was the Black-headed! It was pretty cool to watch it fly less than 30 feet over my head, its bright red bill lit up by the morning sun. Certainly the best looks I have ever had of this species in North America, though I couldn't help but feel a twinge of pain as I thought of my camera resting safely in my vehicle. The gulls appeared to be heading down the canal towards the water outflow at Lock 1. I speed-walked back to my car (if it was a Ross's Gull, I would have been in a dead sprint, scope and everything) and drove back around to the water outfall. Sure enough, the Black-headed Gull was there. The lighting was harsh but I made the most of the sixty seconds or so that I had with the gull and fired off a few usable frames. Some of the ID features can be seen in the above photo, namely the black colouration on the undersides of its primaries, and the deep red bill (though difficult to see well due to the harsh lighting). In its breeding plumage, Black-headed Gull has a neat, dark brown hood, but during the winter it is mostly white headed with a small black dot or crescent on its cheek, much like Bonaparte's Gull. It also happens to be one of the poorest-named bird species I know of. I only had a few chances at photos before it took off for the south, flying high in the sky and cruising along the length of the canal. I stayed at Lock 1 for an additional hour or so, studying the other gulls, and the Black-headed did not return. Given this bird's tendencies I consider myself pretty lucky to have came across it today! 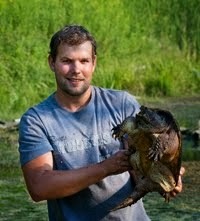 Nice to be in the right place at the right time! Very nice photos of the gull!